Because local practice varies throughout Florida in the expression of particular trial objections, Florida Trial Objections, 5th includes variations so that you can more easily pinpoint the objections you need. 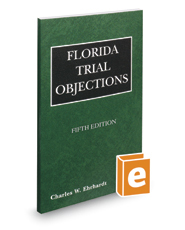 This easy-to-use, handy companion to Ehrhardt's Florida Evidence functions as a basic guide to frequently made trial objections and objections during pretrial depositions. It lays out each objection followed by appropriate responses, citations to controlling authority, and alternate tactics when an objection may be sustained.